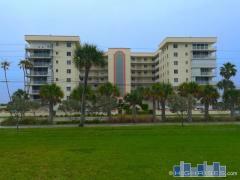 Built in 1985 and located right on the ocean, Ebb Tide is a 13-story high-rise in Melbourne Beach. Building amenities include an outdoor swimming pool, clubroom, and private balconies. Ebb Tide is one of the tallest condo buildings on the Florida Space Coast, and one of the few over 10 stories tall. Have any comments or questions about Ebb Tide? Ask your question and/or share your thoughts about this Building.